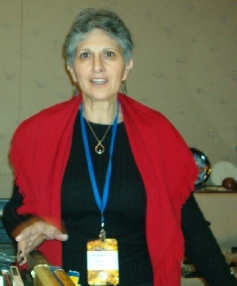 Photos by Diana Jellinek and Mike Marotta. 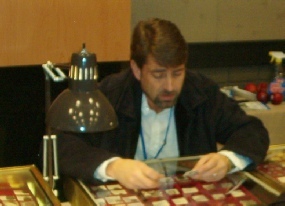 Carrying on family traditions, Dan Sheffer helps collectors of US Type. 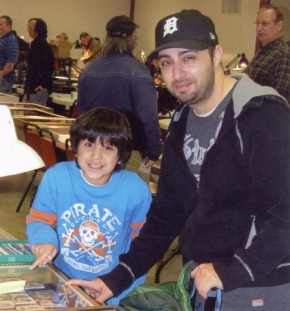 Among his own passions are researching the numismatics of Utica, Michigan. His online name, cwt1863, reflects a family connection to the Civil War store card tokens of Perrysburg, Ohio. Later, Dan was seen at the Basok table buying ANA educational videos. 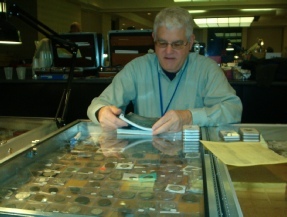 World coins dealer David Harrison checks prices against a recent Seaby catalog. Salah Kahwaji, shows his uncle Mohamed Abdallah coins that he wants to buy. .
Dealer assistant Angela Sanzica of Frank's Currency Quarters was happy to consider applying her future career in medical imaging to the problems of authenticating numismatic material. James Beach views Greek coins offered by a collector. 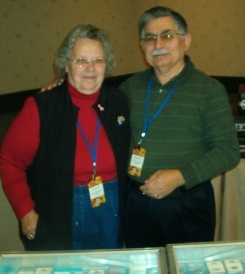 Shirley Seremetis and her assistant Gus are MSNS stalwarts specializing in high grade US Type. I met several of my online friends. As an instructor at Lansing Community College, I was first assigned a username in 1985. I was known as mercury to people called belgarth, scorpio and scoobydoo. Now my friends include conder101, cwt1863, pennyguy and jamez. The first thing I did was chase CSNS past president Bill Brandimore out the door. After arriving early on Friday, Bill had a couple of errands to run and I needed to talk to him about a project of my own. Bill and I met only in passing a few years ago, but we recently exchanged emails. I handed him my card and he gave me his. We were both surprised. He did not know me as a criminologist and I did not know him as the police chief of Wausau, Wisconsin. The project involves the problems faced by archivists and researchers in modern world paper money. Basically, your scanner stops and your printer issues a warning; more on that later. I saw Bill again on Saturday afternoon when I paid my dues to join Paper Money Collectors of Michigan. The PMCM meeting was brief, only 30 minutes, to make room for the Educational Forums run this year by Karl Mark Pall. This year, the Token and Medal Society is celebrating its 50th Anniversary; and TAMS and Mich-TAMS enjoyed a banquet on Friday night. For this year's Saturday afternoon Educational Forum Prof. Pall arranged for presentations on tokens and medals. After the tokens and medals sessions, he then hosted a panel discussion by club presidents on the problems and rewards in leadership. 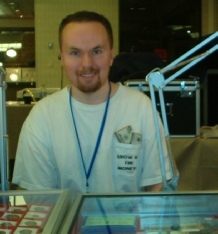 The first Educational session featured MSNS dealer and catalog author, Paul Cunningham on Lincoln Tokens. William Luitse explained how to approach the collecting of Civil War tokens. Tom Dombrowski's topic was "Presidential Inaugural Medals." Tom awarded a Nixon medal to the winner of a quiz-based drawing (right answer plus winning ticket). Despite the fact that the Barack Obama medal was featured in two recent Mich-Matist articles, correct answers were rarer than the medals themselves. 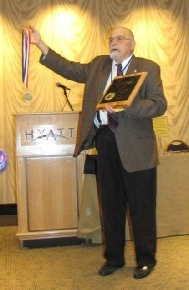 Ernie Nagy's discovery of Michigan State Agricultural Medals came from a family connection to the Gale Manufacturing Company of Albion, Michigan. The Presidential Forum featured six hobby leaders: MSNS past president Al Bobrofsky, MichTAMS president Kathy Freeland, MSNS president Andy Parks, ANA president Cliff Mishler, MSNS past president Ray Dillard and CSNS past president Bill Brandimore. Led by master of ceremonies Karl Pall, they talked in turn about the challenges and opportunities, highlights and dark days of running their organizations. 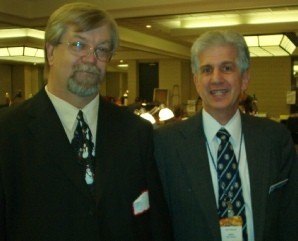 In the audience with me were TAMS president Peter Irion, MSNS Board members Dan Freeland and Larry Sekulich, and the collector known on CoinTalk.com as conder101. 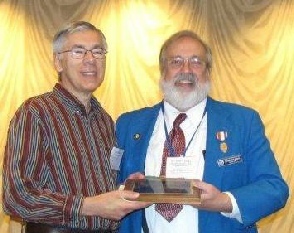 Cliff Mishler quoted Bob Fritsch of the New England Numismatic Association who refers to numismatics not as a business or an industry or even a hobby, but as a community. 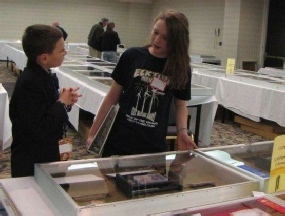 YNs Adrian and Phoenix discuss the Educational Exhibits. 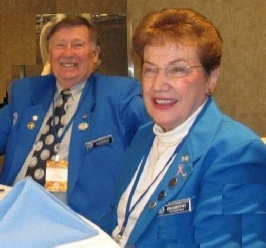 MSNS Past Presidents Albert and Ann Bobrofsky. First place winners in all categories stood for photos at the close of the Sunday morning breakfast. 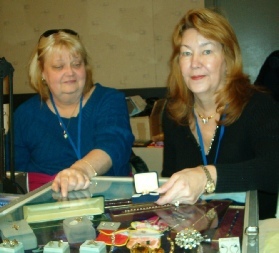 As always, the Bourse floor was busy with over 150 dealers at more than 180 tables in two rooms. Customers talk to Suzanne Stewart (Midwest Rare Coins) standing with her new colleague, Adrian Jellinek. 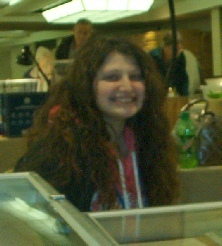 Next to them (right) at JMS Coins was Ansley Sego.